Whether you are a sports enthusiast, love hiking or outdoor activities, or you probably just love to stay home and hang out sometimes, everyone needs a winter jacket at some point to make it through the harsh, cold weather. It is as essential for men, women, and kids are not left out in this must have an outfit. Because of the intensity of the weather, winter jackets have been designed to protect from cold and dry wind too. The Maks long sleeve thermal barrier cycling biking windproof firewall winter jacket is one of the ideal winter jackets on the market that is designed with fantastic features that will not only protect you from the harsh weather but will also keep you warm while you are out. You’ll get more enough information by reading this long sleeve thermal winter jacket reviews. This winter jacket is ideal for men and ladies during winter. It is technically designed as a cycling jacket and as such can withstand the cold breeze and harsh wind on biking trails. It is therefore recommended to all pro and first-time bikers and would make an essential part of their winter cycling kit. This jacket is also ideal for all outdoor enthusiasts if you love camping, game viewing, hunting, etc. You would find the long sleeve thermal barrier winter jacket very useful. It has been designed with amazing features to keep the cold away while you have fun even during winter. It is not only meant for cycling and outdoors, but it would make a great indoor jacket too. You can take this jacket for your cold morning walk any day. This fantastic and versatile winter jacket uniquely features a windproof firewall. This feature makes it ideal for cycling because it will protect you from the harshness of the fast wind during biking. It also features a breathable mid-zero thermal insulation in the back and sides. The breathability of some part of the jacket makes it more comfortable for use in outdoor activities that do not necessarily involve snow and harsh wind. This jacket’s exterior is perfect for temperature regulation and is excellent below 32 degrees F.
This long sleeve winter jacket is also designed with a full-length reflective zipper. The front zipper allows for the convenient use you can quickly wear and remove the jacket at any time. The zipper is also reflective which adds to the visibility of the jacket, especially in low light hours. Extra visibility has a direct bearing on safety as you would be more visible to vehicles or people at morning, night or when in the high forest. The full length reflecting front zipper also allows for proper ventilation from around the zipper. The ergonomic collar with gasket and sleeve is a unique design that makes this brand of winter jacket stand out. This designed has been designed specifically for a contoured ride fit. This way, it not only shuts the cold out, but it keeps you comfortable while you ride in the cold. Unlike some winter jackets that exposes your neck area, the long sleeve thermal barrier winter jacket, completely protects you from the harsh weather condition by ensuring that your neck stays protected. This means that you will not have to buy an additional head/neck covering accessory. Your safety is not left out especially for serious cyclists who love to ride at low visibility times. The reflective tapes allow for added safety and protection as they reflect in to make you visible to vehicles and passers-by when you go for your early morning jog or ride. This is a very important feature to look out for in all your winter jacket as visibility is usually low during this period, and it might be a bit difficult to spot people on the trails. You will no longer have to worry about the safety of your personal items when you go on a ride with this winter jacket. 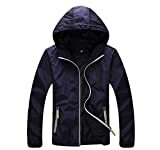 This jacket features elasticated rear pockets in which you can store up your personal items such as cell phones, keys, credit cards, wallet/purse, etc. The elasticated band will help hold your items securely at all times. The fabric of this winter jacket provides an impenetrable layer that helps to prevent water and the wind from getting inside the jacket, thereby providing maximum thermal insulation. This jacket is designed for serious or professional cyclists but can be used by anyone because of its features. – Includes rear pockets and zipper pockets for storing personal items. – Not entirely waterproof, cannot withstand lengthy rains. However, it is ideal for light showers. – The front is not entirely waterproof, because of the breathable material used. Question: Is this jacket waterproof? Answer: Not entirely, but you can use it on your cold morning walks. Question: I am really large, are the sizes available for plus sized? Answer: The long sleeve thermal jacket comes in various sizes including extra large, however, make sure that you are ordering the right size for you. Question: Should I wear this jacket over a regular cycling jersey? Answer: This bike jacket will fit under any undergarment. Question: Can I use this jacket indoors? Getting a winter jacket is a smart move for the winter, but getting a fashionable one that is also very effective is a big deal. 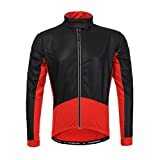 The Long Sleeve Thermal Barrier Cycling Biking Windproof Firewall Winter Jacket is one of the finest on the market designed with lots of features to provide comfort and protection from the weather. If you are a biker or outdoor enthusiast, you will need this winter jacket for maximum thermal insulation during the ride. This winter jacket is water resistant and also windproof, which makes it an ideal choice for the weather. 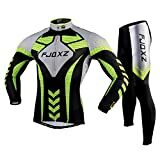 I think you’ll be happy after reading this Maks long sleeve thermal winter jacket reviews and you get a lot more bikes from here.